One of the more popular upgrades we’ve done for many years is called a frame drop. This is simply digging a hole slightly larger than the pool then dropping in the frame and building the pool. The term frame drop is a fancy way of saying sinking an above ground pool. Doing this adds to the installation cost but it does have advantages. For example, when only a portion of the pool sticks out of the earth you can build your pool deck much lower to the ground, making the pool look better and making pool entry a lot easier. 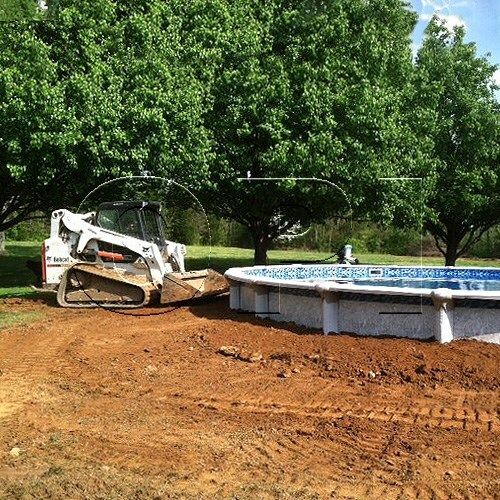 If considering the sinking of your above ground pool, please be aware that there’s a huge amount of earth that comes out of the ground on the average above ground pool, and if you don’t have a very large yard or acreage you’ll need to have a service take about half of that earth away. When we install pools in Florida we recommend going about half way down or roughly 2′-2.5′ at the most. This is because the earth is soft and shifty making it unstable when drained for repairs or new pool liners. If you have a retaining wall surrounding the pool then you could go much further, but you must always keep the water’s surface higher than the pool pump to prevent water circulation issues. The cost of this upgrade in the Orlando area can vary depending on pool size and depth of the hole. But a good guess for most jobs is about $500.